Written By: Jon Kabat-Zinn Ph.D., Prof. Daniel. Goleman Ph.D.
Narrated By: Prof. Daniel Goleman Ph.D., Jon Kabat-Zinn Ph.D. The ideas expressed in Emotional Intelligence ten years ago have taken on a life of their own. They spurred a movement, with enthusiastic adherents in the business world, in medicine and healthcare, at home, in the field of education and the world at large. Several million people, including business managers, human resource departments, healthcare workers, teachers, parents and students, have applied the ideas and principles expressed in Emotional Intelligence to their fields with tangible and quantifiable results. Leading with Emotional Intelligence Conversations is an ongoing dialogue series that begins with luminaries in the field of business. In the world of business we have only scratched the surface of how principles of emotional intelligence can increase profitability and efficiency in the workplace. Jon Kabat-Zinn, is renowned for his work as a scientist, writer, and teacher bringing mindfulness into everyday life. He has dedicated his career to the fields of mind/body medicine, integrative medicine, and self-healing. 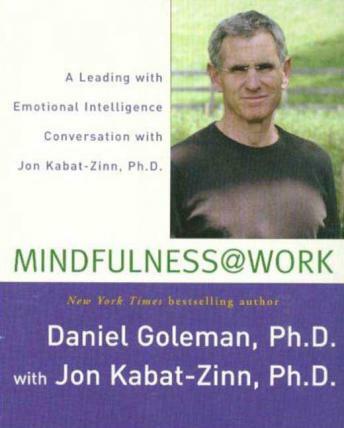 Here, in this groundbreaking audiobook, Jon Kabat-Zinn and Daniel Goleman explore some of the ways in which mindfulness can be applied by a variety of institutions and businesses to make better leaders and improve the quality of the workplace. by Jon Kabat-Zinn Ph.D., Prof. Daniel. Goleman Ph.D.